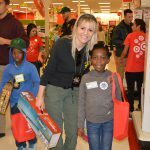 Checking out during Shop With a Cop. 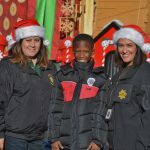 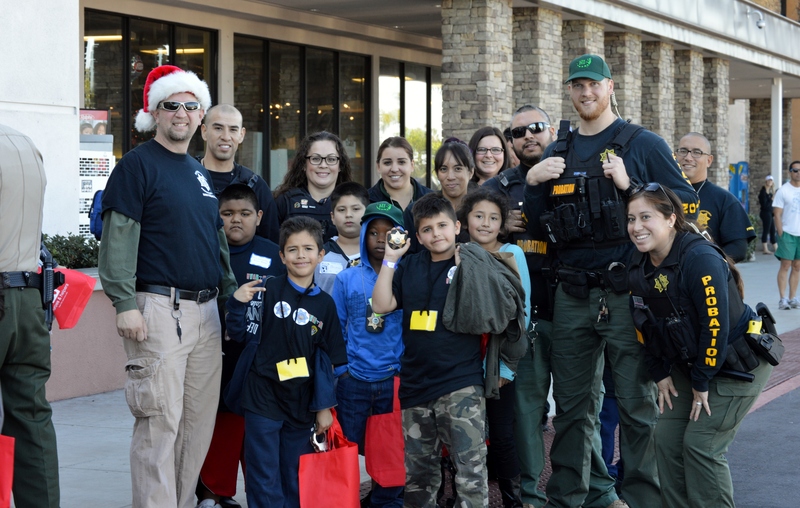 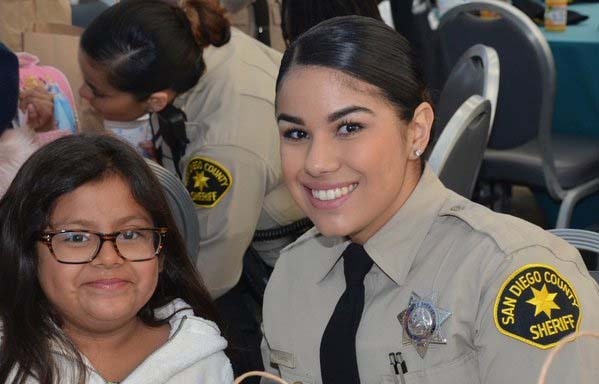 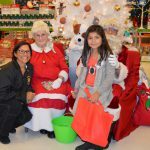 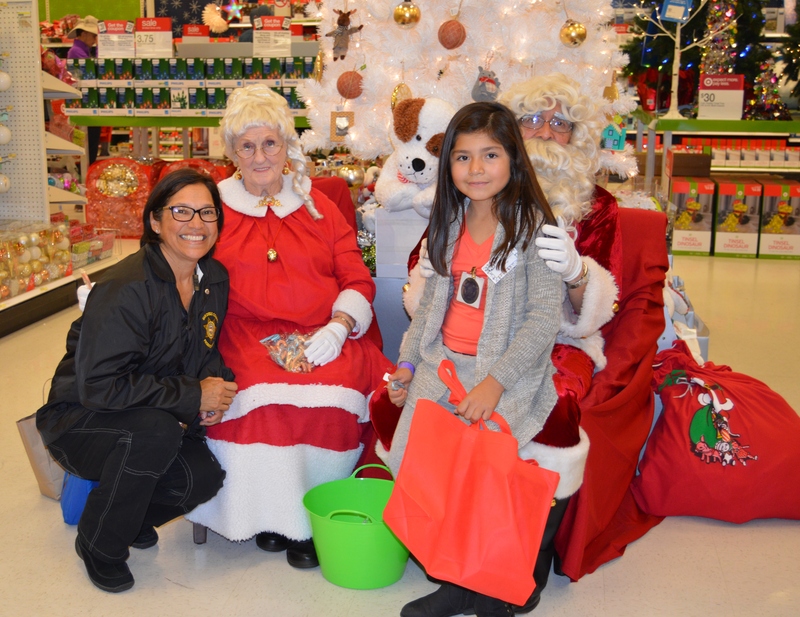 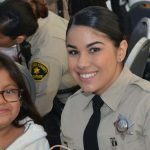 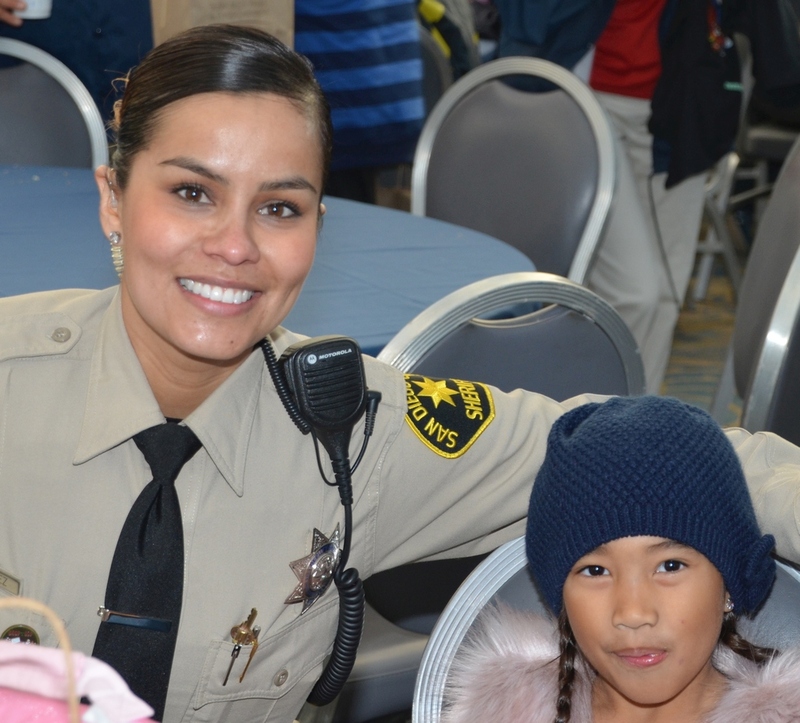 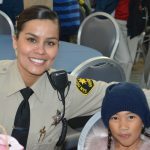 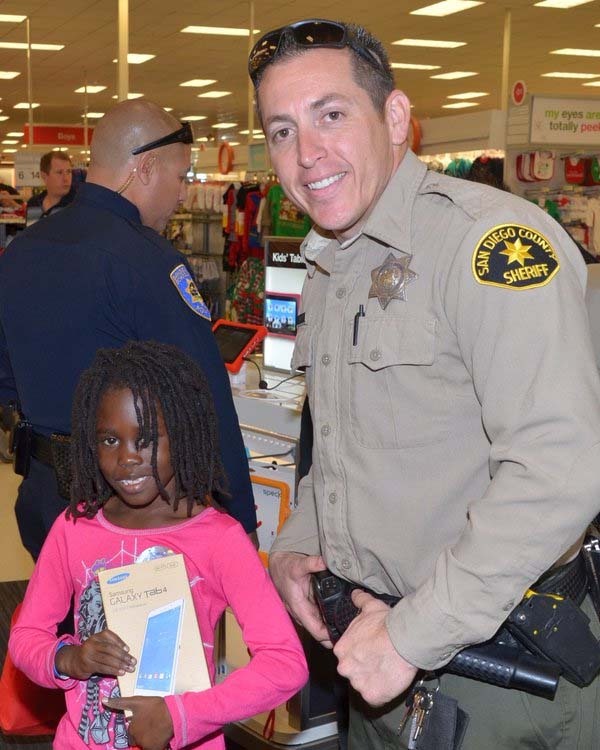 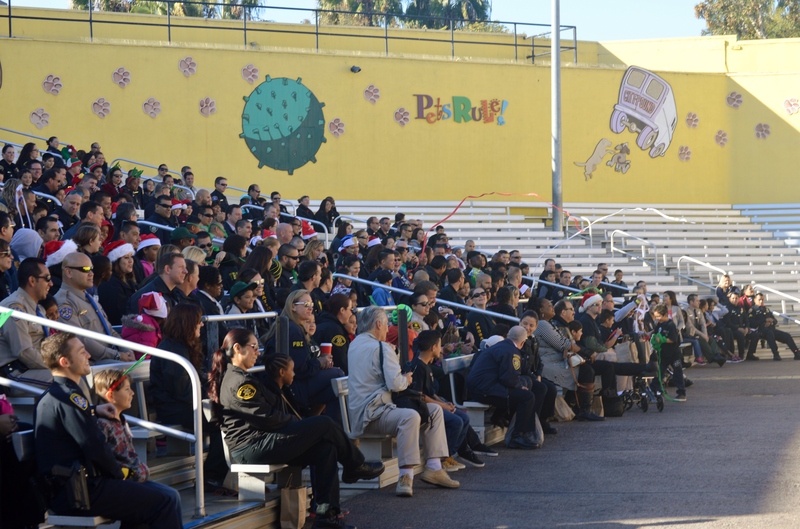 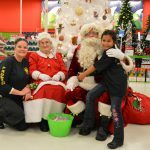 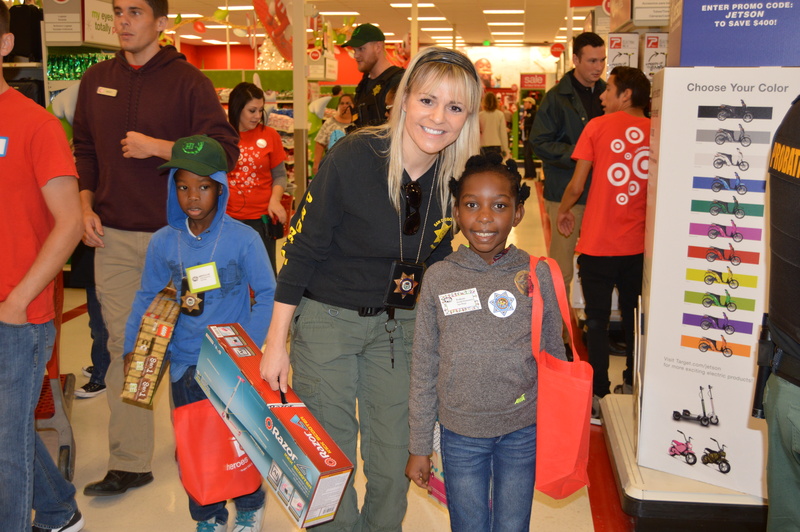 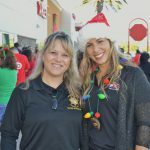 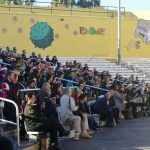 More than 300 third graders joined local, state and federal law enforcement officers – including members of San Diego County Probation, Sheriff, District Attorney and Public Defender – for the 22nd Annual Shop With A Cop event Saturday. 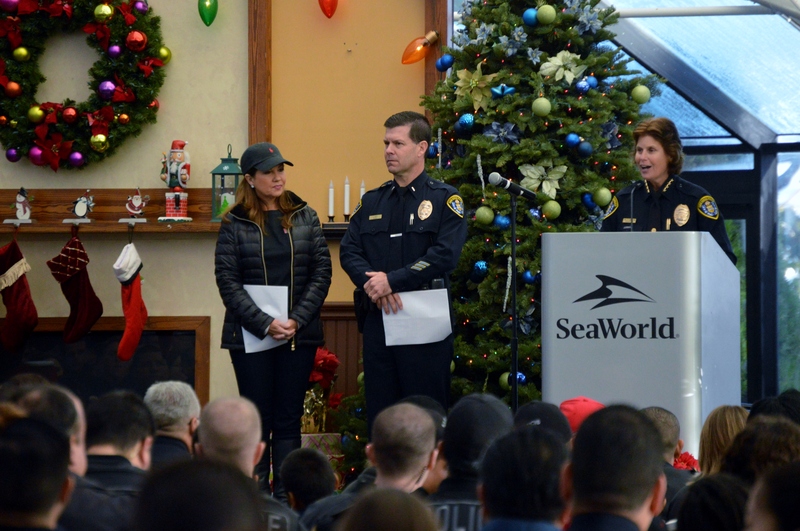 The children were paired with officers and treated to a special performance at SeaWorld as well as four passes to visit again with their family. 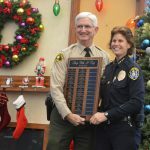 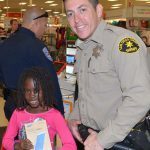 Afterward, they caravanned over with lights flashing and sirens blaring to the Midway area Target store, where the children were given $150 to spend on gifts for the holidays.The annual event is sponsored by local law enforcement, SeaWorld, Target, STAR/PAL and the San Diego Crime Commission. 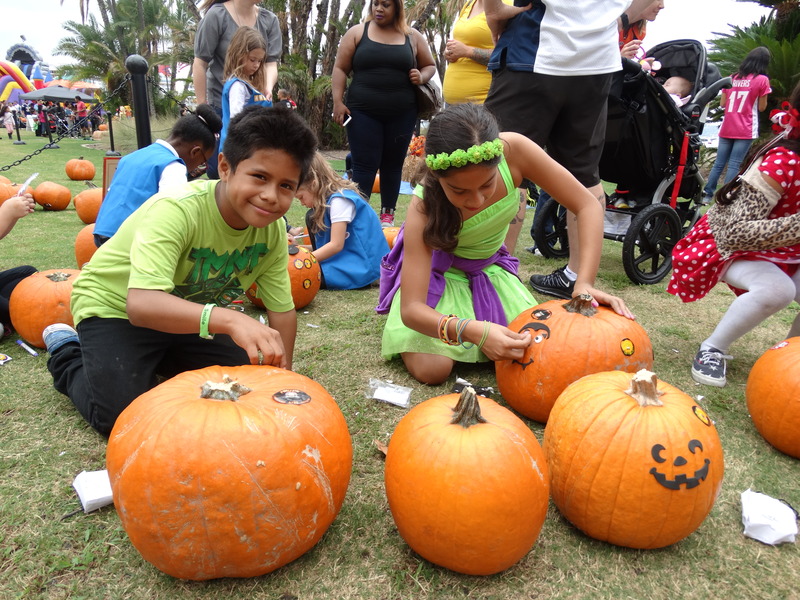 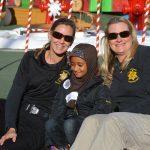 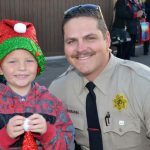 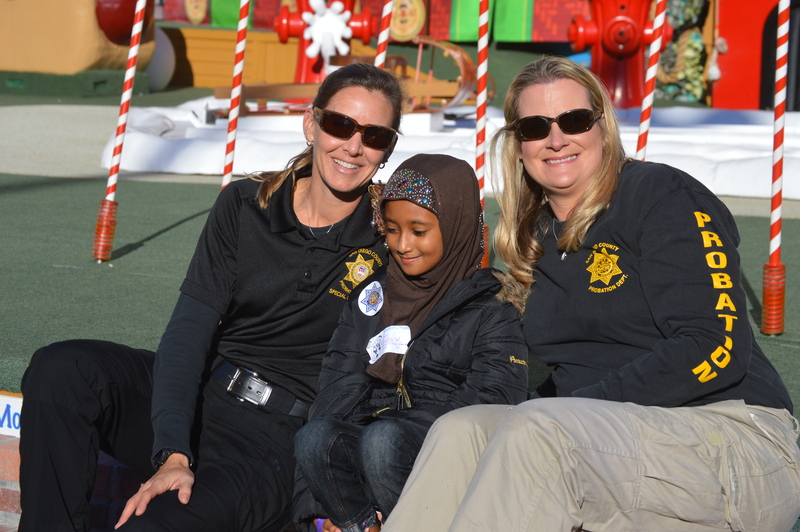 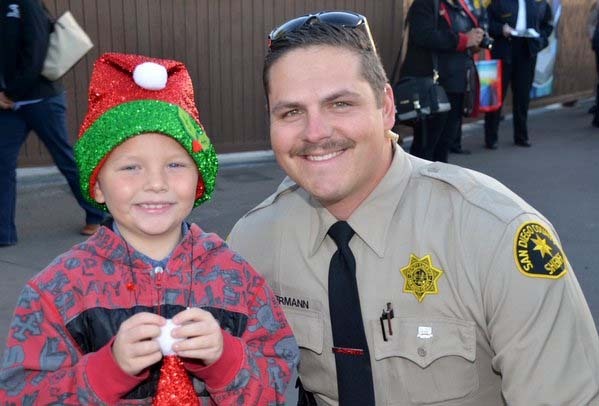 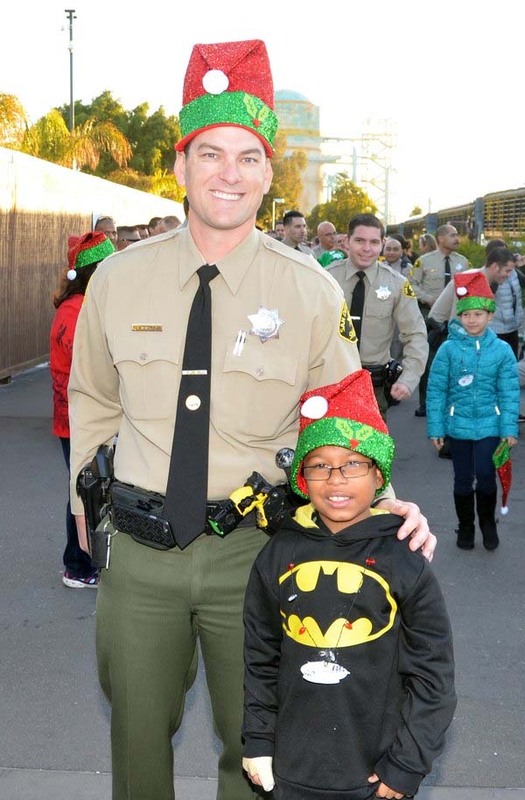 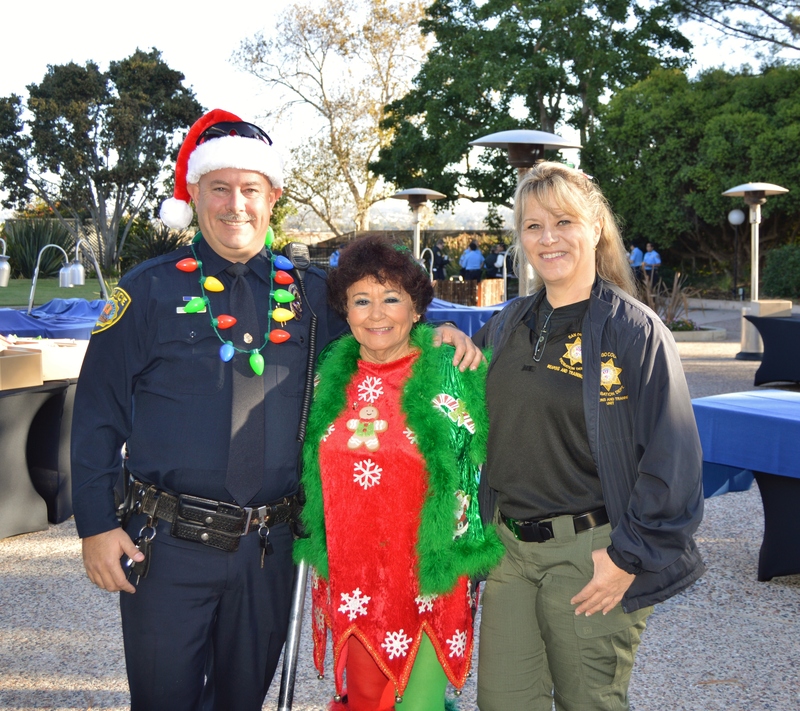 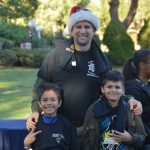 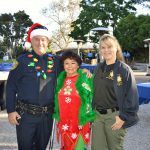 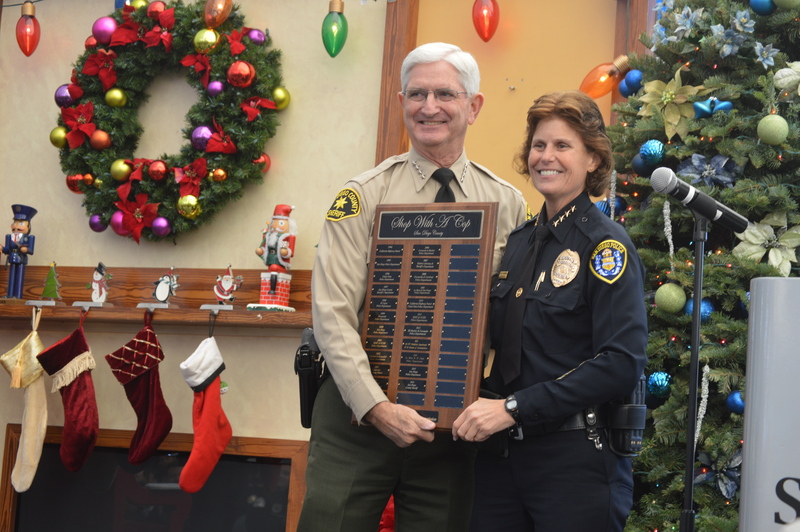 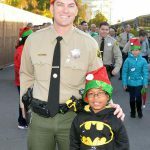 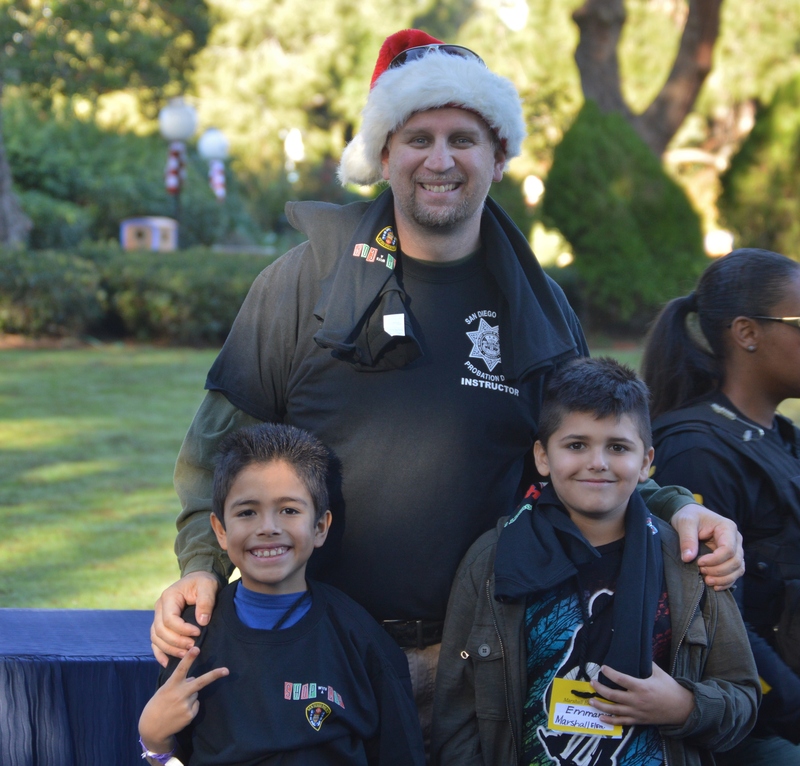 This year’s event, hosted by the San Diego Police Department, provides children with a happier holiday season and encourages positive interaction with law enforcement. 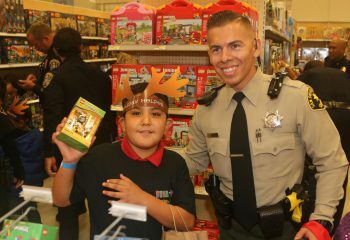 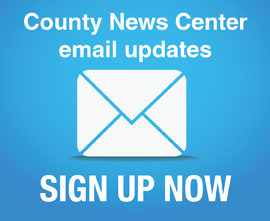 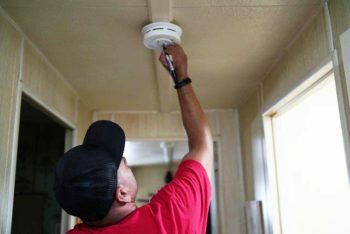 Photos courtesy of San Diego County Sheriff’s Department and San Diego County Probation Department. 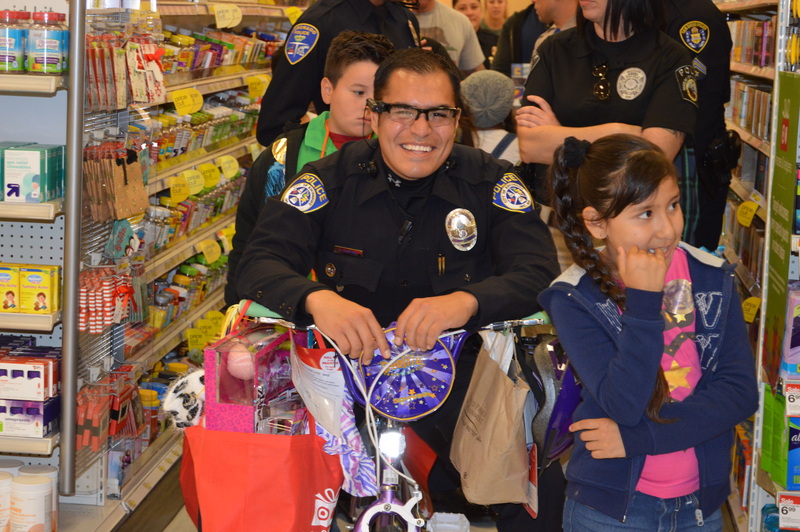 Shop With A Cop buddies. 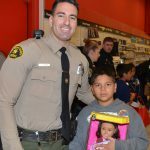 Shopping for a loved one. 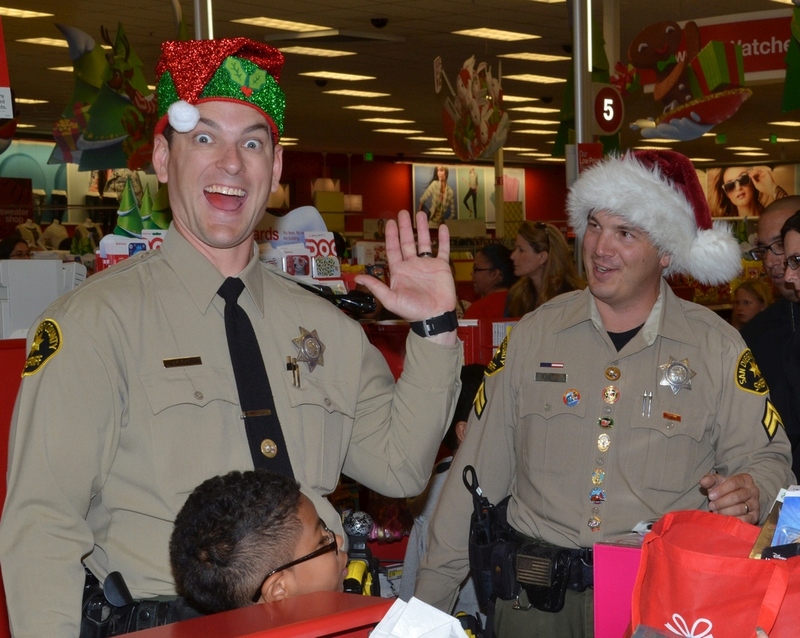 Shop With A Cop fun is contagious. 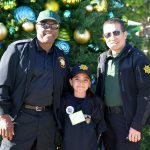 Ready for Shop With A Cop fun. 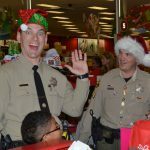 Shop With A Cop partners. 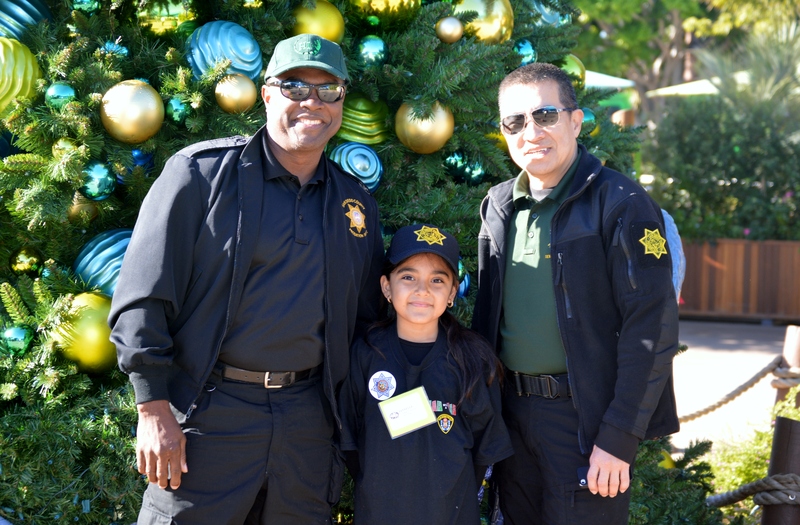 Partnering up with a deputy. 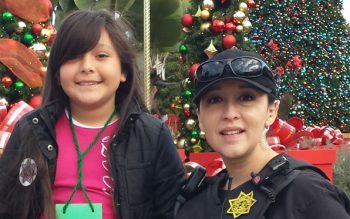 Shop With A Cop first stop: Sea World. 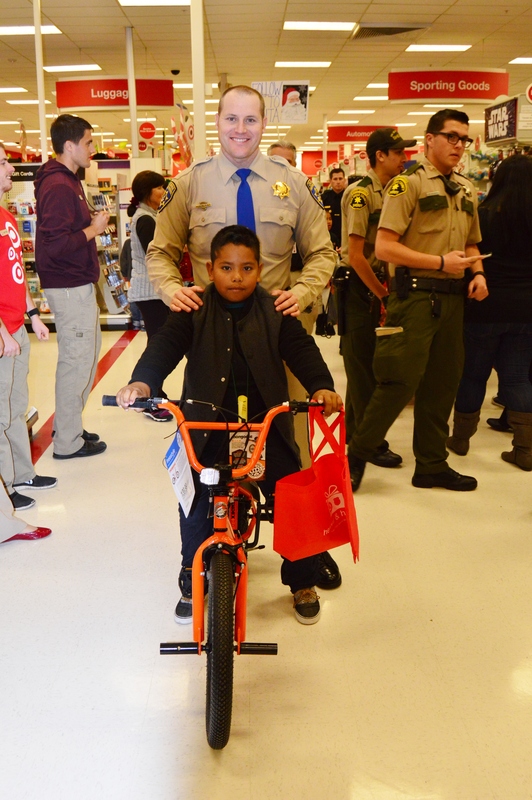 Shop With A Cop welcome ceremony. 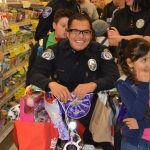 Getting into the Shop With A Cop spirit. 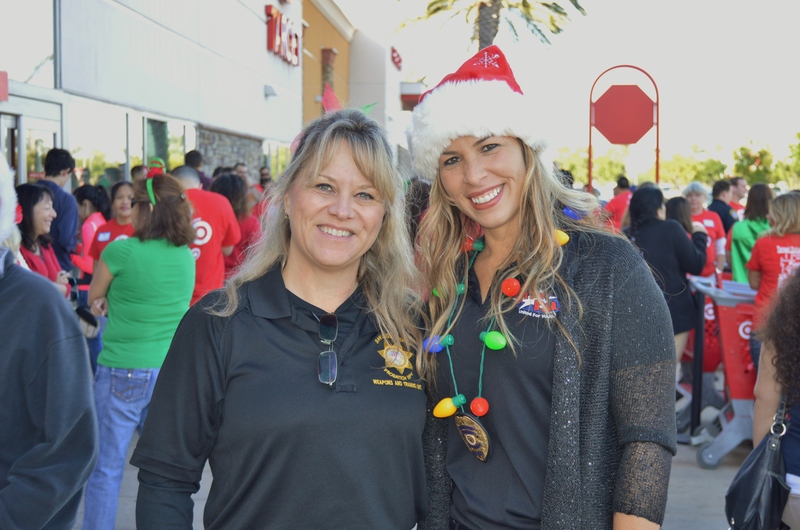 Sheriff Gore and San Diego Police Chief Shelley Zimmerman welcome all the children, officers and sponsors for Shop With A Cop. 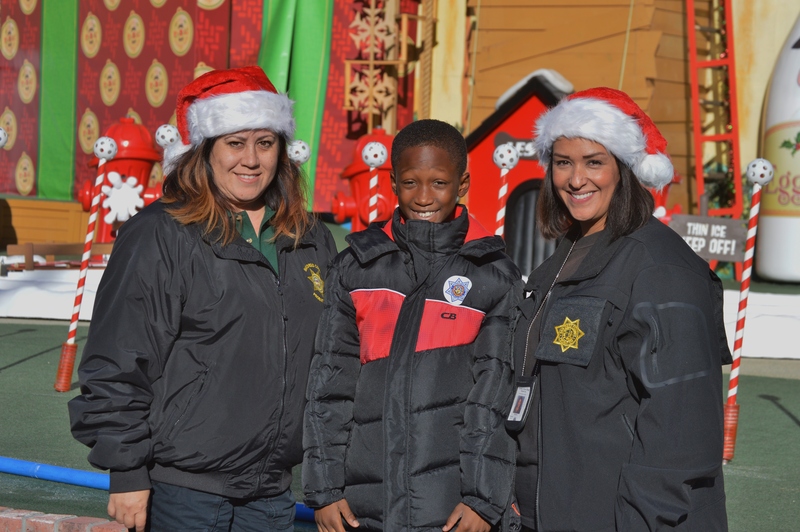 A Shop With A Cop third grader with his two Probation personal shopper partners. 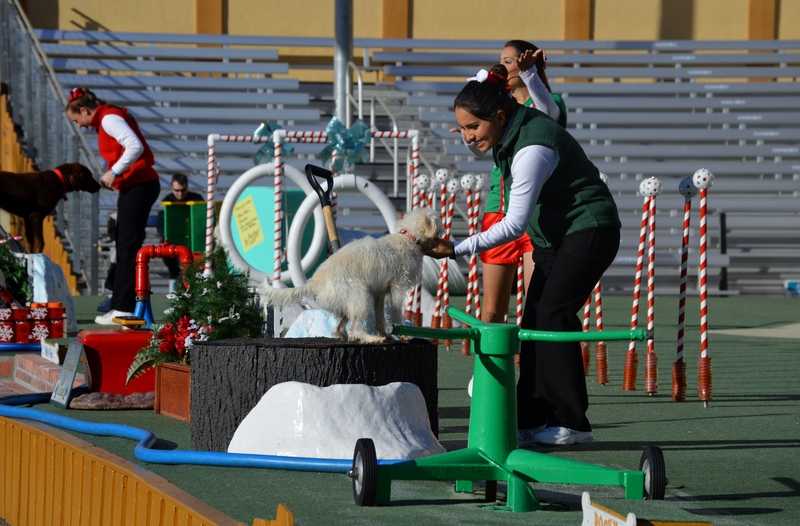 Pets Rule performer on stage. 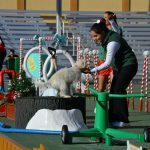 Sea World Pets Rule show. 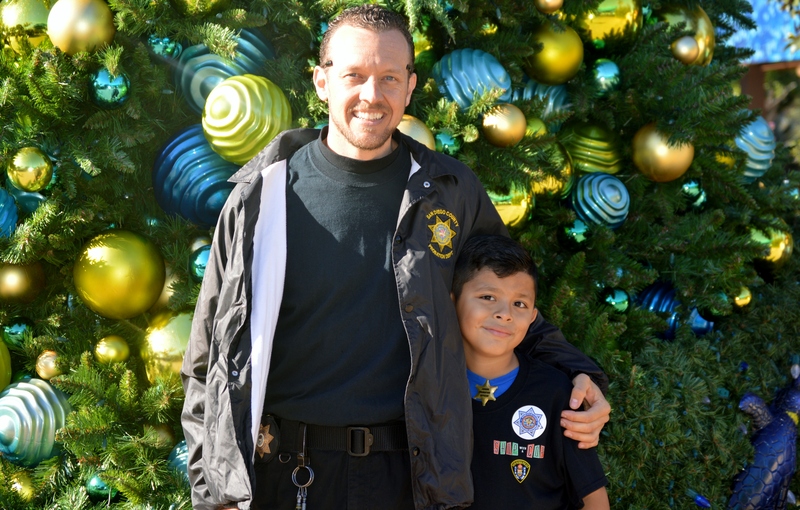 In front of the Sea World tree. 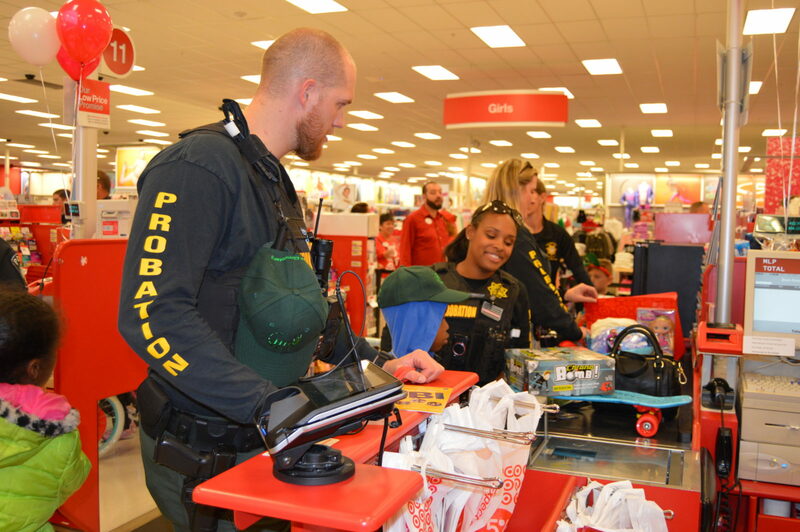 Shop With A Cop 2015 pairs. 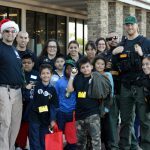 A few Shop With A Cop 2015 coordinators. 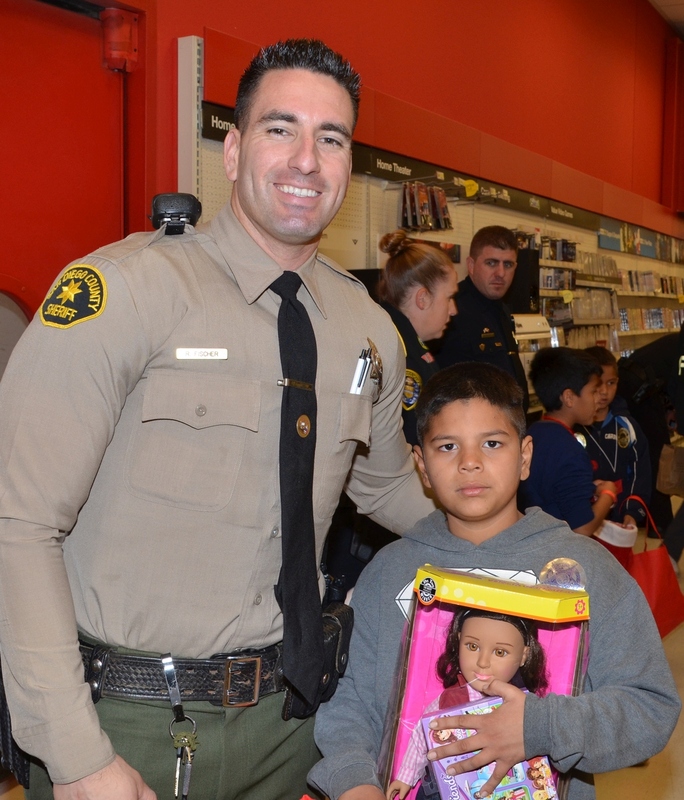 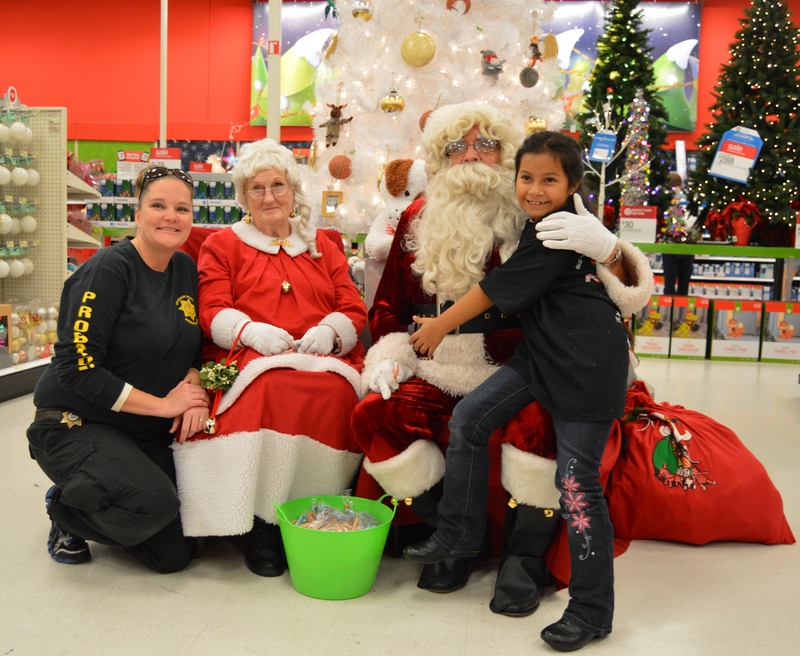 San Diego County Probation officers and their kid shopping partners. 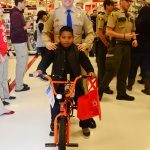 A new bike for the holidays. 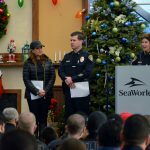 A Razor scooter was on someone’s list. 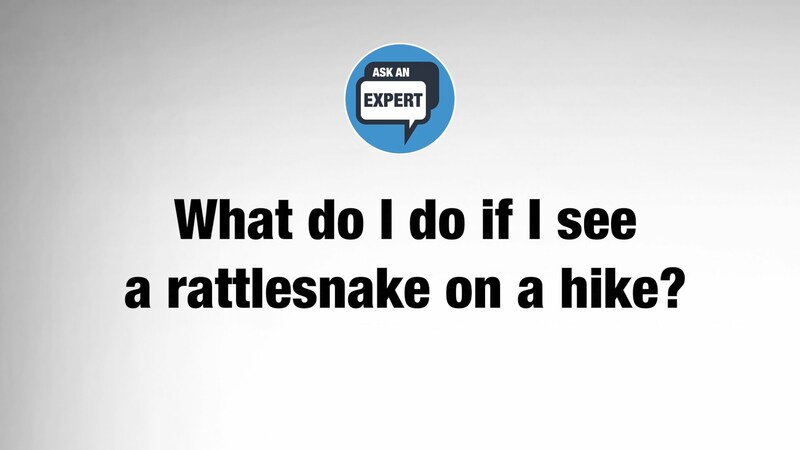 Next Story Next Story: VIDEO: Snake on the Trail! 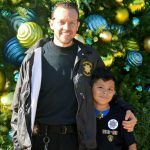 What Do I Do?